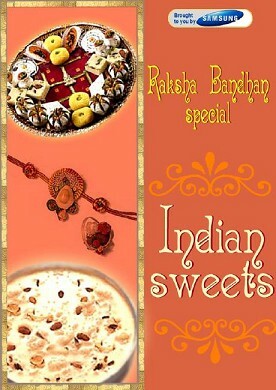 A celebration of the bonds between a brother and sister, the family holiday of Raksha Bandhan (Rakhi) is observed in most Indian communities around the world. In India and many Indian communities, anyone close to you who does not have a sister or brother of their own may be honored as brothers and sisters on this day. The highlight of the observance is when a sister ties the rakhi, a silk string, around her brother's wrist. More elaborate modern versions may be gold or intricately woven strands of silk, but the traditional rakhi given to brothers on Raksha Bandhan is a single strand of silk that symbolizes the bond. The silk is delicate...almost invisible, but extremely strong. The brother usually gives a gift in return -- sometimes sweets, but very often a generous gift of money to help his sister through the year!